Print beautiful charts for a great price with our chart printing service. 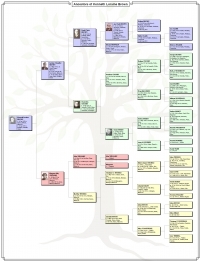 First, create the chart in the Legacy Charting software (included with Legacy Family Tree). Then, in Legacy Charting, click on the Publish tab, then click on Order Chart. Legacy Charting will create stunning graphical charts - ancestor, descendant, fan, hourglass, bow tie, and even DNA charts. Choose bond, presentation, glossy, or matte canvas finishes. Then click on the Order Now button, and we'll send your chart to your front door.